The UC Davis Bioanalysis and Pharmacokinetics Core Facility is a component of Dr. Rogawski's laboratory. 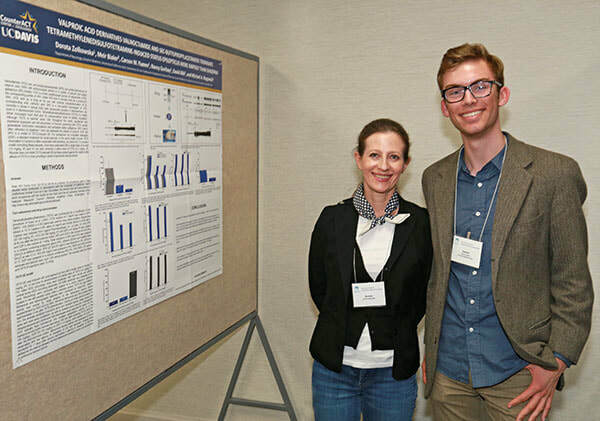 Student Carson Flamm and Dorota Zolkowska, M.D., Ph.D. presenting a poster at the 20th Annual Meeting of the American Society for Experimental Neurotherapeutics. The meeting was held in Rockville, Maryland, March 7-10, 2018. Lab group celebrates Emir's exit seminar. Emir completed his thesis research in partial fulfillment of the Ph.D. degree in Pharmacology and Toxicology. He presented his exit seminar on September 24, 2014. Dan Feldman, Ph.D. with student Katie He at patch clamp rig recording from SCN1A voltage-gated sodium channels expressed in HEK cells. Patch pipette puller and thermocyler for PCR. Patch clamp rig for recording from cultured neurons. This rig is used for recording from voltage-gated sodium channels. Graduate student Emir Leon at the patch clamp rig. Emir is recording from HEK cells stably transfected with GABA-A receptors. Video-EEG systems for status epilepticus studies. System allows continuous acquisition of the EEG and EMG while recording a video of the animal's behavior. Waters Xevo TQ-S tandem quadrupole mass spectrometer with Acquity UPLC, a state-of the art bioanalytical system for pharmacokinetic measurements. Lisa Olsen, laboratory assistant, and Dorota Zolkowska, M.D., Ph.D., project scientist, provide expertise in seizure studies, particularly with video-EEG monitoring. Dose-Response analysis using the log-logistic and probit models written in R using Shiny by Yingjia Chen is available here. Documentation is available here. The statistical methods for the selectivity index is Student's t-test for comparison between two groups and ANOVA for multiple groups.